There’s a fine line when it comes to free-to-play games. Offer your customers too little and you end up with a glorified demo, offer them too much and they’ll never pay - leaving you with an expensive project to maintain and little hope of turning it into an ongoing business past that initial influx of players. 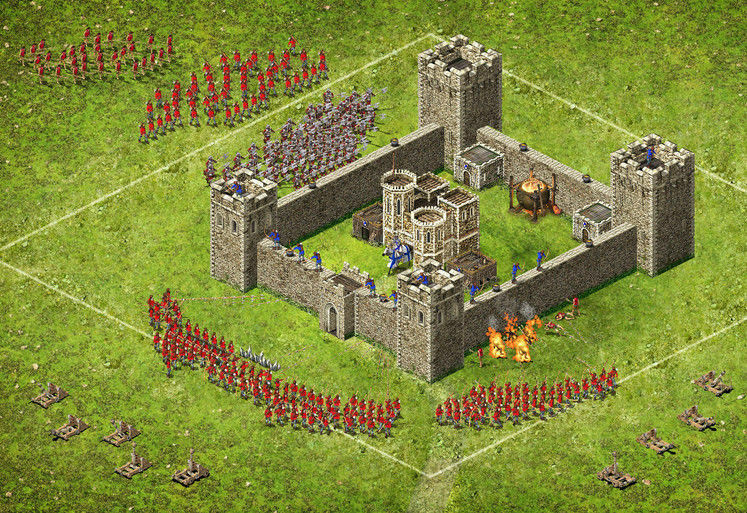 Stronghold Kingdoms is Firefly Studio’s attempt at getting that balance right, offering up a rich massively-multiplayer strategy game with some serious monetisation hooks for those that want to invest. And for the most part, they get it absolutely right. As you might have guessed then, Kingdoms is - at its heart - a medieval village management game and castle builder, in much the same spirit as its predecessors. 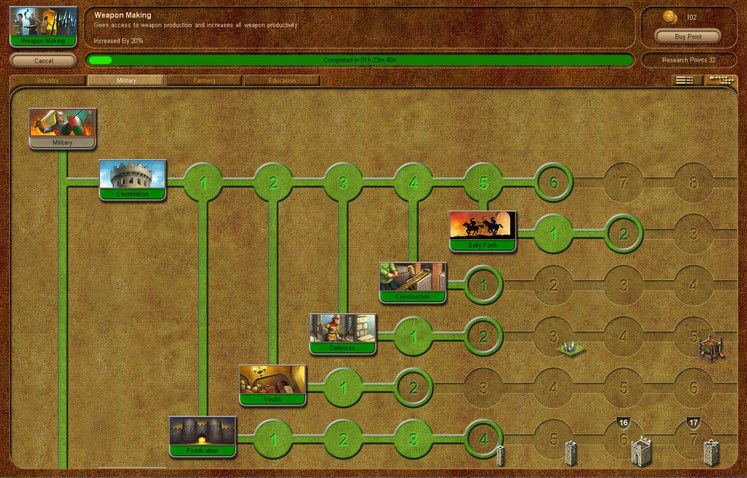 You’ll pick your starting location from anywhere on a semi-realistic map of the UK and get down to business mining resources, attracting new citizens, trading goods on the marketplace and researching your way to power down a massive tech-tree on which - even after a couple of weeks of play - I’m still barely scraping 50% completion. To start with though, a thorough tutorial covers all the essential basics. 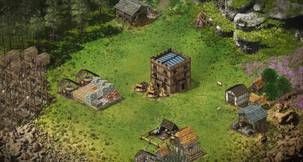 You’re offered up a simple plot of land for your newly-crowned village, and you’ll soon be up and running with a few wood cutter’s huts and stone quarries, allowing access to basic resources with which to build more advanced structures. It should quickly become apparent at this stage that placing your buildings is of absolute paramount importance, which each section of land offering up different efficiency rates for various structures. In general, placing your wood-based buildings near the trees and your stone or iron-based structures near the rocks will suffice, but it’s key to learn micro-management at this stage rather than later on. Building and research queues are limited to one a piece unless you’re shelling out for a ‘premium’ token to unlock a five-slot queue in either, but fortunately prices are low enough to keep that within reach of most players (7 days of premium works out around £1.60 at current rates). That single research queue can be utilised for as long as you’d like of course, but once you start hitting the 2-3 hours it takes to build units later down the tech tree, it becomes a no-brainer to subscribe when you need to. Crucially, the pricing doesn’t feel oppressive. The other essential component in the monetisation of Kingdoms comes in the form of a card system that grants players temporary boosts to any number of areas of gameplay, such as speeding up traders or adding a quick stash of fish or weaponry to your reserves. Whilst these can be safely ignored for the most part, it’s a decent system for experienced players that need a quick fix for their chosen base-building plan, and they represent a good boost for newcomers wanting to try out new things quicker than they otherwise could. Packs of cards can be purchased and then traded back or swapped out for something more suitable, and again the pricing is fairly pleasant, working out at around 40p for a 5-pack containing gameplay boosts that can last for up to a day at a time. Once you’ve balanced those elements and gotten into a build rhythm then, progress will be familiar to anybody that’s played a base-building strategy game before. Decisions have to be made about which goods to produce in order to sell them for a profit at the market, whether to build another structure in your village, whether to spend the cash on making your existing production facilities more efficient, or whether to research and gain access to new technology. The pacing of those actions is inevitably slowed down to a crawl in order to cater for the existence of a huge online world in which everybody is vying for power, but rather than becoming a frustration to the singleplayer components, the online interactions are what ended up keeping me checking in every day. I can’t stress enough just how alive the presence of other players makes Stronghold Kingdoms feel. 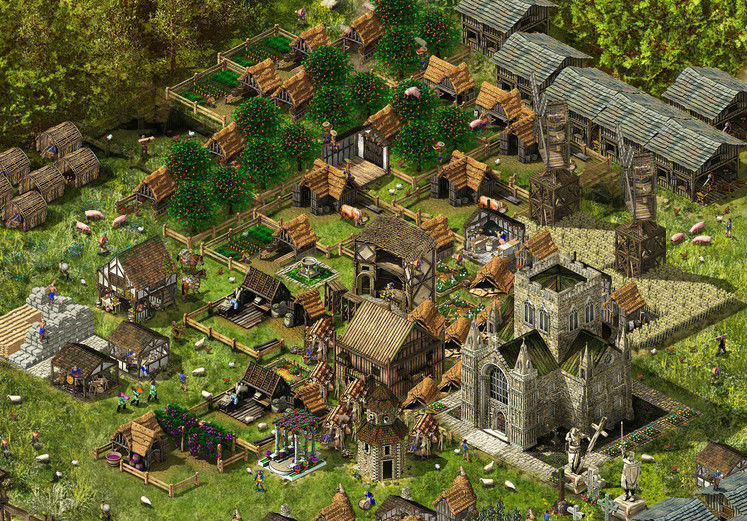 Scaling out from your village reveals a mass of other lords tending to their own villages in your area and beyond, and it’s the deep ties into the local economy and political alignments of each region that make for the most interesting long-term gameplay mechanics. Selling goods, as a basic example, is set on a supply-and-demand basis in each local marketplace. Just last week, somebody flooded my parish with thousands of units of cheese - which was enough to render my stock essentially worthless. Sure, I could send my traders further afield but that costs time as they trundle across the map, so why not try diplomacy instead? One quick message later and we’d both agreed to produce a specific type of food to sell to our local market, and we’d also agreed to assist should any other players come rolling in to raze either of our villages to the ground. And believe me I needed that assistance, as castle management - as it turns out - was never my strength. As the second pillar of gameplay, sitting alongside your village is a barren piece of land on which to design a suitable stronghold utilising carefully-siphoned resources from the village economy. Other players and AI troops can attack this whenever they like (military and weaponry form another key part of the research tree), with a loss meaning you’ll either lose resources, troops, defences or honour (which acts as XP). Frequently you might lose a little of all the above, but sometimes, as I found out to my cost, it’s everything. 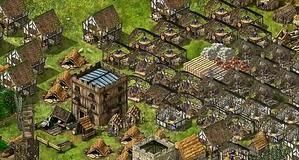 There are two ways with which to attempt avoiding having your village razed and requiring a fresh start (research and honour levels are kept in those instances, meaning you can boost through the initial base-building stages quickly). One of which is to design a castle with sturdy defences and plough money into troops to guard it, and the other is making sure you don’t annoy anybody nearby. Unfortunately new players may well make the mistake of doing neither of those things (as I did), resulting in rather irate local opposition that may well teach you not to scout their village without permission or to vote against them when it comes to running the local parish. Lesson, learned. Of course in that instance you could just move somewhere nearby and plot revenge by carefully acquiring a mass of troops. You could also move back to the same area and attempt diplomacy, or you could pick up your bags and move to a different part of the country altogether, picking a different ‘class’ as you make your way down the tech tree and making fresh mistakes as you go. The variation is fantastic, and there’s a whole lot to keep strategy veterans happy in that regard. Unfortunately though, it’s those long wait times that might also turn them away, and anybody that doesn’t get sucked into Stronghold Kingdoms’ player interaction may well find a fairly dry base-builder with excruciating pauses between being able to make new units or buildings. If you don’t fill that time with exploration, scouting, player communication and plotting, there’s not a whole lot to recommend here that goes beyond any of the decent singleplayer titles. In my opinion, that’s the essence of the game, and once you pull back the map view and realise that there are hundreds of real-life players around you, the possibilities quickly become enticing. There are a whole lot of things I want to try over the next few months playing Stronghold Kingdoms, and it’s gotten its teeth into me such that I’m ploughing a little time into it at least three times a day and not feeling cheated for any of the money I’ve spent. For a free-to-play title at the very least, that has to be mission accomplished.